The Portland Vase is a Roman cameo glass vase, which is dated to between AD 1 and AD 25, though low BC dates have some scholarly support. It is the best known piece of Roman cameo glass and has served as an inspiration to many glass and porcelain makers from about the beginning of the 18th century onwards. 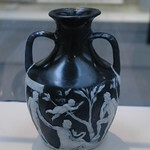 It is first recorded in Rome in 1600-1601, and since 1810 has been in the British Museum in London. It was bought by the museum in 1945 (GR 1945,0927.1) and is normally on display in Room 70. The vase is about 25 centimeters high and 56 in circumference. It is made of violet-blue glass, and surrounded with a single continuous white glass cameo making two distinct scenes, depicting seven human figures, plus a large snake, and two bearded and horned heads below the handles, marking the break between the scenes. 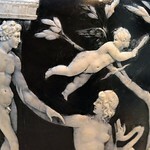 The bottom of the vase was a cameo glass disc, also in blue and white, showing a head, presumed to be of Paris or Priam on the basis of the Phrygian cap it wears. This roundel clearly does not belong to the vase, and has been displayed separately since 1845. 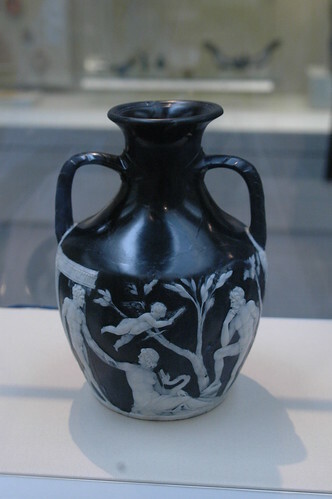 It may have been added to mend a break in antiquity or after, or the result of a conversion from an original amphora form (paralleled by a similar blue-glass cameo vessel from Pompeii) - it was definitely attached to the bottom from at least 1826.